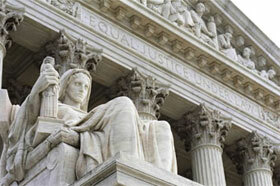 On January 23, 2012, the U.S. Supreme Court announced its unanimous decision in United States v. Antoine Jones (No. 10-1259), a case addressing the constitutional privacy rights of American citizens in the face of modern tracking systems based on GPS and other technologies. The Court ruled that law enforcement must obtain a warrant prior to attaching a GPS device to a suspect's vehicle in order to monitor its movements. In this case, the FBI and District of Columbia police affixed a hidden GPS device to the vehicle of suspected drug dealer Antoine Jones in a public parking lot. The device recorded and transmitted the vehicle's movements for 28 days. Whether the government violated Jones's Fourth Amendment rights by attaching the GPS tracking device to his vehicle without a valid warrant and without his consent. On behalf of the Court, Associate Justice Antonin Scalia stated that the government's installation of a GPS device to monitor the vehicle's movements constituted a "search," meaning a valid warrant had been required. As a result, the evidence gathered by the device was inadmissible, and the Court upheld the prior decision overturning Jones's conviction. Associate Justices Samuel Alito and Sonia Sotomayor offered separate opinions concurring with the majority, but highlighting the fact that the Court did not fully address the first question above -- i.e., whether the long-term monitoring of citizens' movements violates their reasonable expectations of privacy. The justices believe the question should be addressed as the use of GPS and other surveillance technologies proliferates.